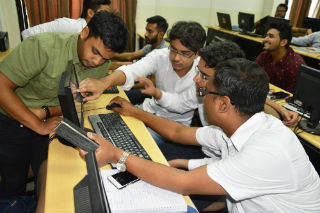 Dr. Amit Jain introduced participants to the basic concepts used to handle SPSS software and its utility along with a comparison with Ms Excel’s Data. He also provided the conceptual knowledge about how to test hypotheses and parametric testing, Type I and Type II errors in a brief. He explained a normal distribution curve and importance the x and y axis that it formed and invited examples from the participants and explained. He provided training from the basic entry of data in excel to calculation of descriptive statistics, cross tabulation, checking normality, regression, correlation and to perform ANOVA in SPSS. Hands on experience on SPSS to calculate parametric and non parametric tests gave the participants clarity and confidence. In the post lunch session the speaker exposed the participants to factor analysis and gave them hands on experience using examples. The core objective of the workshop was to equip the research scholars with set of skills and potentiality to undertake research very effectively in the disciplines of social science and to convert this research into publishable material of high quality in the form of articles. This workshop was designed to offer the practical guidelines and direct the researchers through all the stages of research from identifying a research problem to the submission of a dissertation, report writing and research article. The course intends to deal with variety of quantitative and qualitative research methods used in social science researches. It also gives exposure to data analysis with the help of software packages. The workshop consists of both theory and practical. By the end programme they are expected to develop conceptual clarity and practical knowledge to undertake quality research and writing good research papers field-reports and project proposals etc. All participants expressed their satisfaction about the workshop and program was concluded with happy note from everyone.